Along with the increasing needs for advanced features of safety and comfortability, today’s automotive system requires a large number of ECUs (Electronic Control Units) inside it. As the number of ECUs increases, automakers are facing numerous problems such as increased weight, shrinking passenger space, and architectural complexity of wire harness. 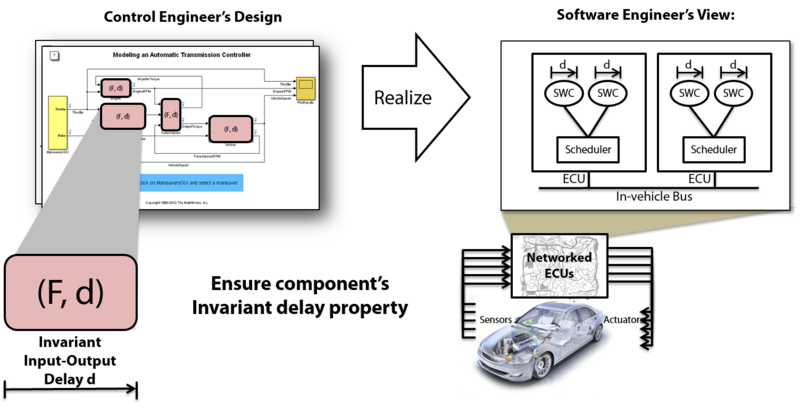 To reduce the number of required ECUs, we need to integrate multiple existing control systems into a single ECU. This software integration incurs various challenges since the integrated system should maintain the already validated control behavior of each systems before and after the integration. As an initial target, we pick an integrated powertrain management system which controls both the engine and the transmission, which are usually controlled by separate ECUs. 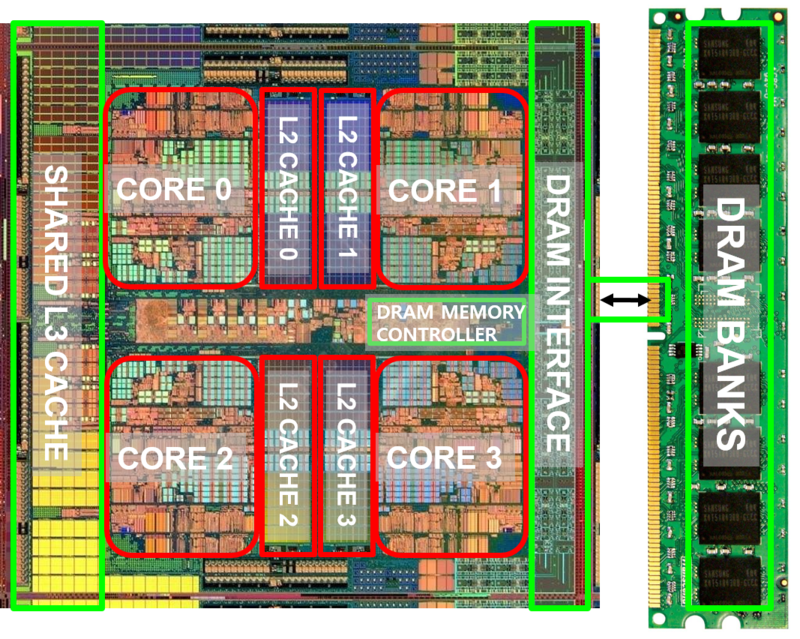 To catch up the increasing computing demand of future automotive systems, multicore ECUs are becoming widely accepted in the automotive industry. However, it is also true that automakers are very skeptical and thus passive to applying multicore ECUs in their production vehicles. The most serious problem is about how to manage the shared resources such as caches, memory controller, and shared memory, which significantly affect the performance of real-time applications running on each core. 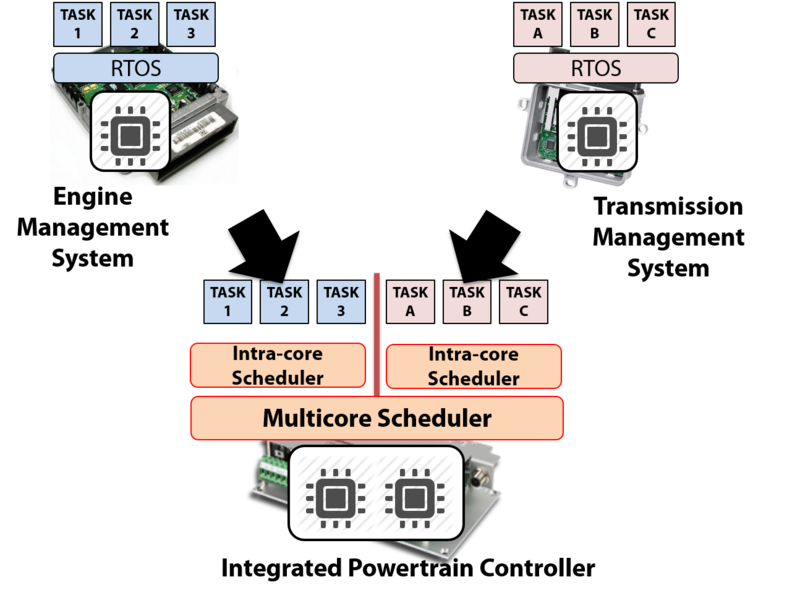 This inter-core interference problem makes it very difficult to validate multicore-based real-time systems. This research is trying to solve this challenge by analyzing and optimally manage the shared resource contention. It is very important to validate control algorithms in the early development stage. For that purpose, RCP (Rapid Control Prototyping) is widely used for the early validation of control systems, which, however, lacks the ability to validate the temporal behavior since it only simulates the functional behavior of the target. To overcome this limitation, our research develops a real-time simulation framework which also simulates the temporal behavior caused by both RTOS scheduling and CAN bus arbitration. Using our real-time virtual ECU simulator, developers can validate the whole automotive system’s both functional and temporal behavior in the early development stage, which saves tons of engineering efforts and money. As automotive software grows complex and large, the validation of the produced code becomes an important issue when qualifying the production vehicle. 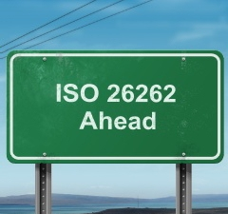 Moreover, due to ISO 26262, the process of source code validation has become an essential part of automotive system development. Thus this research develops an source code static analysis platform which is specifically targeting automotive control systems. Using our tool, automakers and suppliers can efficiently validate their source code base for the purpose of certification or testing. Automotive software systems are getting larger and more complex as new advanced features are added. Thus, such complex software systems should be designed by composing less complex SW components to manage the complexity. Although the functional correctness of the entire system can be easily verified by validating each SW component’s invariant functional behavior, since each SW component’s temporal behavior changes due to the underlying HWs and surrounding SW components, it is difficult to validate the temporal correctness of the resulting system. In order to solve this problem, this research proposes a novel framework that realizes the given control transactions on networked ECUs guaranteeing SW component’s invariant input-output delay property. By guaranteeing SW component’s invariant delay property, the entire system’s temporal correctness can be easily validated from the constructing SW components’ delays.